It has been suggested that this article be merged with Fourth Succession War. Operations GALAHAD and THOR were extensive military exercises conducted variously by contingents of the Armed Forces of the Federated Suns and the Lyran Commonwealth Armed Forces for a number of purposes, including general training, an assessment of the capabilities of the LCAF and the relative success of efforts to cross-train the LCAF and AFFS, and finally as clandestine preparations for the Fourth Succession War. The precursors to Operations GALAHAD and THOR were a number of small-scale wargames conducted between elements of the AFFS and LCAF from 3024 onwards. The Alliance Games generally saw the LCAF units participating perform poorly in comparison to the AFFS counterparts and proved somewhat divisive, with political opponents of the alliance between the Federated Suns and the Lyran Commonwealth finding plenty of things to help fuel their campaigns of opposition. Despite the poor performance shown by the LCAF, First Prince Hanse Davion saw enough merit in the LCAF to initiate the second stage in a long-term plan aimed at destroying or disabling the greatest threats to the security of the Federated Suns: the Capellan Confederation and the Draconis Combine. Operation GALAHAD was the name given to large-scale wargames within the Capellan and Draconis Marches of the Federated Suns. Although only the one Operation name was used, consecutive GALAHAD exercises were held in 3026 and 3027 and were due to be held in 3028. In 3026 Prince Hanse launched the first set of exercises to be conducted under the name Operation GALAHAD. These exercises involved ten 'Mech regiments and one hundred infantry and armor regiments drawn from the AFFS. Conducted in the Capellan and Draconis Marches, both the Capellan Confederation Armed Forces and Draconis Combine Mustered Soldiery went on high alert and stayed there for three months, convinced that the exercises were a cover for invasions of their respective realms. No such invasions occured, although a small number of raids were conducted under cover of the exercises, and the majority of the deployed units returned to their respective homeworlds. Both House Kurita and House Liao had issued widespread condemnations of the conduct of Hanse and the AFFS, but the exercises were largely accepted as having been the preparation for defensive operations Hanse originally claimed them to be. Two of the Regimental Combat Teams that had participated in the GALAHAD exercises in the Capellan March were permanently reassigned to that March after the conclusion of the exercises in November, but CCAF intelligence was dismissive of the redeployment - possibly out of a sense of relief that the anticipated invasion hadn't occured. In August 3027 Hanse Davion repeated Operation GALAHAD, but this time on a larger scale; almost thirty 'Mech regiments and more than two hundred armor and infantry regiments were deployed, a military deployment that numbered almost a third of the AFFS. The Prince also commandeered commercial JumpShips and DropShips from the interior of the Federated Suns to the border regions. This time, Operation GALAHAD was conducted without using ComStar as a means of transmitting messages - instead, the various wargames were managed via messages couriered between JumpShips in a relay method that was so evocative of the Pony Express system of communication used in North America on ancient Terra that the tactic became known by the same name - Pony Express. The CCAF and DCMS went on high alert again in response to GALAHAD 3027, but not to the same level that had been maintained the previous year - although the flow of invective from the capitals of Luthien and Sian remained largely unchanged. 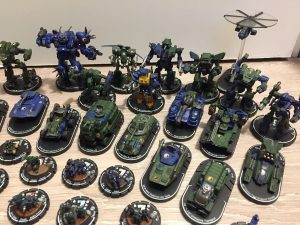 Once again, Hanse Davion used the GALAHAD exercises as a cover for the permanent redeployment of troops into the Capellan March - this time, four complete BattleMech regiments and another two RCTs. In another scaling-up of his preparations, the AFFS also retained the services of twenty-two commercial JumpShips and thirty commercial DropShips which had been commandeered for the exercises, although the AFFS continued to pay rent for their use of the vessels - albeit at a level that elicited grumbling from the various owners of the ships. Only one Operation THOR would actually be conducted, and that Operation took place in 3027. Operation THOR was an opportunity for Archon Katrina Steiner to demonstrate that the LCAF could mount massive, complex troop movements on a similar scale to that of the AFFS. Despite the problems caused by heavy bureaucracy and a number of foul-ups, some thirty LCAF 'Mech regiments and more than one hundred infantry and armor regiments conducted exercises as a part of Operation THOR on fifteen assorted worlds on the borders with either the Draconis Combine or the Free Worlds League. The DCMS, conditioned in part by Operation GALAHAD in 3026, went on alert but not to the same level with which it had responded to the earlier GALAHAD exercises. In contrast, the Free Worlds League Military went onto a full war footing. As with the redeployments in the Federated Suns conducted under the mask of GALAHAD 3027, permanent LCAF troop movements were concealed within the exercises. Regiments from the Periphery border and interior regions of the Commonwealth were moved to the border with the Draconis Combine, and the LCAF seized - albeit politely - a number of commercial JumpShips and DropShips that remained under LCAF control after the end of the exercise. Although intelligence assets belonging to the Capellan and Combine governments were in some cases accurately reporting the movement and buildup of forces in the border regions of the AFFS, the various high commands in both nations remained dismissive of the reports. In what appeared to be an attempt to allay the concerns of their neighbours, when the AFFS and LCAF announced in June 3028 that they intented to repeat their military exercises, they dispatched detailed information on the exercises to the governments of the Combine, Confederation and League. These plans contained highly detailed information on troop movements and deployments - information that led to both the First Prince and the Archon being labelled as traitors by some within their own governments. The various governments remained remarkably complacent where the two exercises were concerned, lulled into a false sense of security because of the exercises conducted over the two previous years. Despite an increase in the scope of the exercises yet again - this time, AFFS deployments included all eight RCTs of the Crucis Lancers to the world of Mira on the Capellan border, while the LCAF committed more than forty 'Mech regiments to exercises the length of the border with the Combine - the responses remained low key. The DCMS went on alert again, but at a relatively low level - nowhere near as high an alert level as either of the previous two years. The DCMS actually redeployed some forces away from the border with the Commonwealth, moving them to the border with the Federated Suns because of the increased tempo of activity on that border. The CCAF bolstered local defenses in the Tikonov Commonality but did little more, in part because of significant troop buildups on both Kittery and Ziliang. Each of the various rulers was convinced that with detailed copies of the various AFFS and LCAF troop movements available to them, they would be able to detect any perfidy or deception on the part of either military with relative ease; adding to the laxness of their response was the upcoming wedding of Hanse Davion and Melissa Steiner, the designated heir to the Lyran Commonwealth, a marriage which was due to be performed on Terra on the 20th of August 3028. Captain-General Janos Marik, Chancellor Maximilian Liao and Coordinator Takashi Kurita were all convinced that there was no way Hanse Davion would attempt something during his own wedding, and the AFFS and LCAF continued to follow their planned itineraries scrupulously up until the very eve of the wedding. When Hanse Davion announced the start of the Fourth Succession War as a part of his wedding speech, he caught all three rulers completely by surprise - along with the bulk of their respective militaries. Masked by Operations GALAHAD and THOR, large-scale invasions of the Capellan Confederation and Draconis Combine began, invasions which would prove highly successful for the Federated Suns and the Lyran Commonwealth. The military announced today that an undisclosed number of troops would be involved in a set of wargame exercises dubbed Operation Galahad. The operation is set to begin next month and will involve large numbers of troops in both the Draconis and Capellan marches." A subsequent news article dated 1 September 3026 (also from MechWarrior I) further details the operation. ↑ 1.0 1.1 1.2 1.3 1.4 1.5 1.6 NAIS The Fourth Succession War Military Atlas Volume 1, p. 8, "Operations GALAHAD and THOR"
↑ NAIS The Fourth Succession War Military Atlas Volume 1, p. 8, "Military Matters"
↑ 3.0 3.1 3.2 NAIS The Fourth Succession War Military Atlas Volume 1, p. 9, "Operation RAT"
↑ 4.0 4.1 4.2 4.3 4.4 4.5 NAIS The Fourth Succession War Military Atlas Volume 1, p. 10, "Operations GALAHAD and THOR"
This page was last edited on 3 February 2018, at 13:08.